in the warm first light and supervise. balancing act, treading air before ascending. and pleased to entertain the gods. 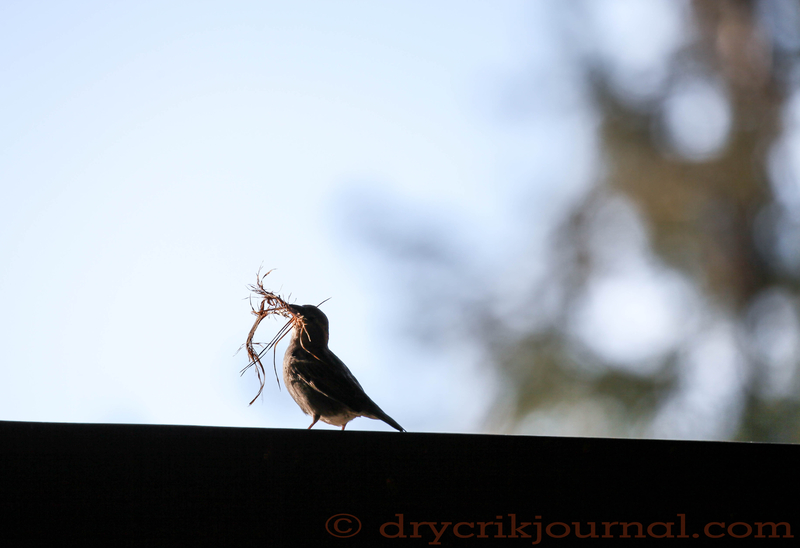 This entry was posted in Poems 2015, Ranch Journal and tagged House Sparrows. Bookmark the permalink. fine illustration of ‘the least of these’ as Jesus would have said . . . The male Sparrows equate to our politicians. Although Sparrows and Finches can be a bit messy, it’s the “Midnight singing Mockingbirds” that refuse to let you sleep that can get my feathers ruffled. Unable to sleep nights because of their incessant chattering, my sweet grandmother had a two-bit bounty on Mockingbirds when I was a boy. However, the male House Sparrows, I suspect, will pale by comparison to the fluffing we will endure for the next 18 months.